Singaporeans are not doing enough to prepare for retirement, according to BlackRock’s Global Investor Pulse Survey 2017. The discovery comes at a time when insufficient funds for retirement has become an increasingly pressing concern worldwide, in light of today’s low-yield environment. BlackRock’s annual survey polled 28,000 people throughout 18 markets – including 1,000 in Singapore – by asking questions on financial and investment management and the likely impact on their retirement. Results showed 64% of Singaporeans worry about running out of money in retirement, the highest proportion in Asia Pacific. Nearly nine out of 10 Singaporeans (87%) believe they are responsible for their own retirement income. However, this realization has yet to spark action – only 68% have started saving despite the fact they save an average 15% of monthly income, the highest rate worldwide. Some 84% are saving beyond the mandatory requirement of the Central Provident Fund (CPF), or in other forms of savings plan. But it is clear respondents are underestimating how much they will need for retirement, in many cases by as many as six years. Singaporean investment leans heavily on cash – 47% on average, which is slightly higher than in other parts of the region but much lower than the rest of the world – meaning Singaporeans may not be able to achieve enough income from their existing portfolios. Millennials in Singapore demonstrate a high awareness of the need to save for retirement, and are concerned about outliving their savings and becoming a burden to their families. Nearly two-thirds (62%) of millennials have begun saving for retirement, a significant increase from 2015 (56%). More impressively, 87% of those now saving are making additional investments beyond the mandatory CPF requirement. In fact, 27% (vs 24% of Singaporeans generally) are saving into private pension plans, and 22% (vs 18% of Singaporeans generally) are making further voluntary contributions to the CPF. This represents the highest proportion across all age groups in both categories. Sentiment is generally positive amongst millennials, with half (50%) feeling confident of accumulating adequate retirement income, while 49% are confident of making retirement-focused investment decisions (scoring higher than the average among respondents in Singapore). This indicates positive investment behavior from the younger population. Singapore is home to a technology-reliant population, with online channels (55%) being the main source of investment information before financial advisers (42%) and family and friends (39%). Although most are using technology for basic functions such as information-gathering, routine monitoring and everyday banking, a fifth (20%) of Singaporeans find technology helpful in monitoring their retirement prospects. This is seen to be providing motivation to adjust spending patterns, retirement dates, income expectations and portfolios. In fact, 64% of Singaporean respondents are willing to buy an investment online. Of this group, nearly half (46%) said they prefer to obtain professional advice either before or during a transaction, while 36% need reassurance from a trusted brand. It becomes evident that financial advisers and technology are used as complementary sources of information when Singaporeans make investment decisions. It will take a long time if we just rely on savings for retirement. We should learn how to make our money grow as well to reach our retirement targets. Income is also important as if we have higher income, it makes it easier to save without having to squeeze ourselves too much. The BlackRock Global Investor Pulse Survey is one of the largest global surveys ever conducted and surveyed 28,000 respondents in 18 markets. In North America: The US and Canada. In Europe: France, Germany, Italy, the Netherlands, Spain, Sweden, and the UK. In Latin America: Brazil, Chile, Colombia, and Mexico. In Asia: Mainland China, Hong Kong, Japan, Singapore and Taiwan. The survey in Singapore involved 1,000 respondents. The survey took place in January and February 2017 and was executed with support from the TNS Group, an independent research company. Retirement Survey Results - Understanding Our Needs and How To Achieve It? 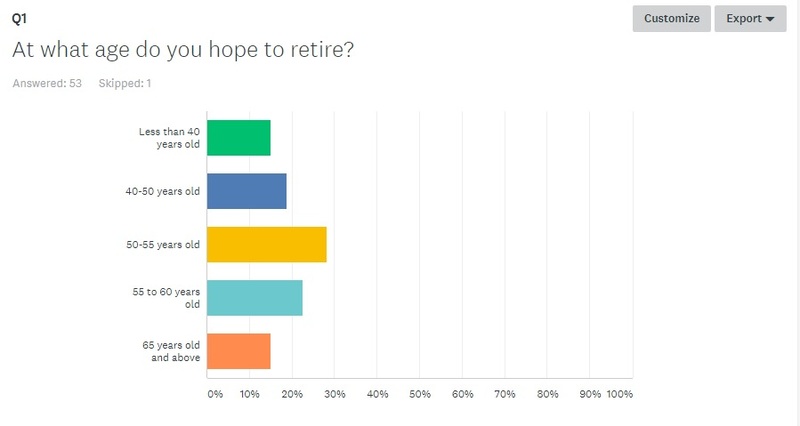 One week ago, I launched a retirement survey on my blog and said I will release the results and also write it into a blog post. Thanks to all who have done the survey. There were quite a good handful of responses which made this blog post possible. The purpose of this post is to show what other readers, like yourself, think about retirement needs and then I will provide some examples to show how we can actually achieve our targets for retirement. Let's begin. Q1: At what age do you hope to retire? For the first question, most people are looking to retire at the age of 50-55 years old or 55 to 60 years old. This seems to coincide with the time we would be getting our CPF at the age of 55. I guess its also a achievable age to retire after working for about 30 years or so. There are also quite a number of people who are looking to retire at the age of 40-50 years old. Let's see how is this possible in the later part of this post. Q2: How much do you think you need per month when you retire? 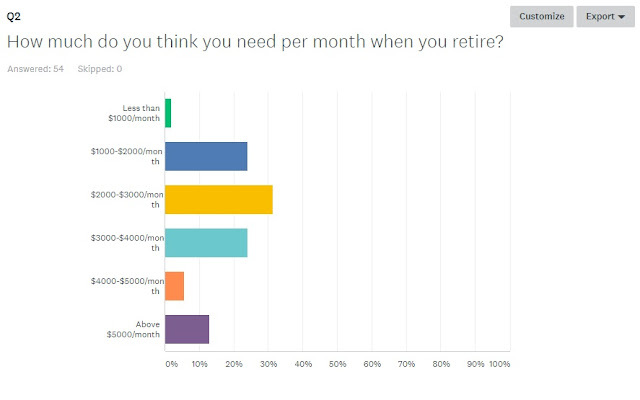 For question 2, people generally think they need about $2000-$3000 per month for retirement. There are mixed responses where some think they need $1000-$2000 per month while others think they need $3000-$4000 per month. I guess this depends on individual lifestyle and preferences. We will look at how to achieve our desired monthly income for retirement too. Q3: How much savings do you think you need by the time you retire? For question 3, it seems like most people believe they need at least 1 Million dollars to retire. Some felt they just need about $500,000 to $1 Million. 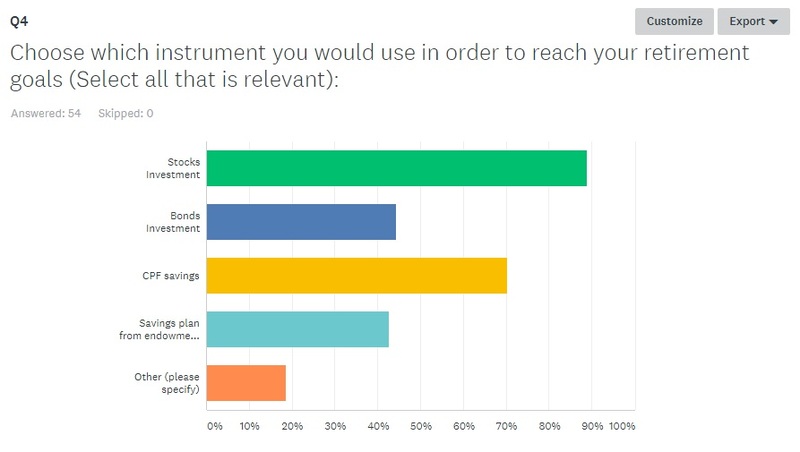 For question 4, most people feel they can use a variety of instruments to reach their retirement goals. Stocks and CPF savings are 2 of the best instruments which people feel they could use. Q5: Do you worry you would not have enough money for retirement? 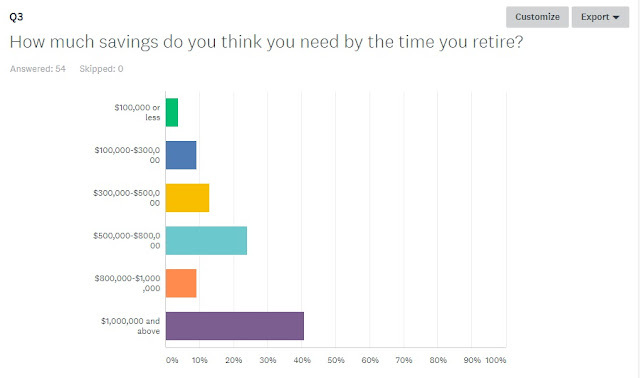 For question 5, most people are worried about having not enough for retirement. I guess its very hard to know what will happen in the future so people are generally worried. However, I think if we plan well ahead and have more information on how to achieve our retirement goals, it will be much better for us. In summary, the survey results show that most of us want to retire around age 55 with a monthly income of $2000-$3000 and we think we will need $1 Million in order to achieve that. Let's say if we start saving and investing at the age of 25, how much must we save to achieve that? How about if we start later, can we still achieve our retirement goals? 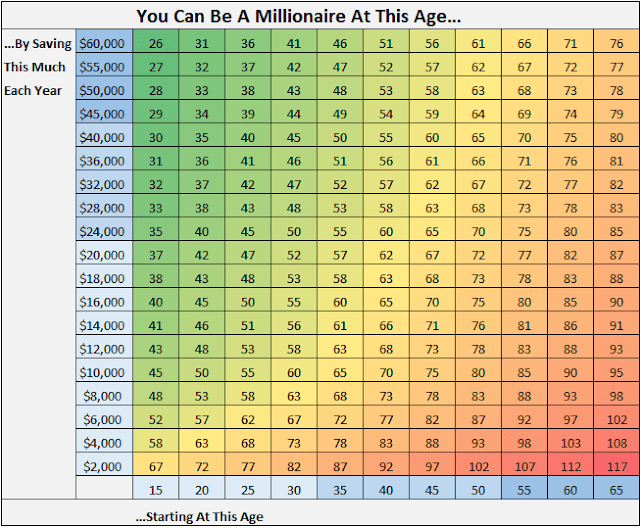 I came across this million dollar age grid from fourpillarfreedom.com. I love the grid because it shows very clearly how we can achieve our goals in just one grid. This grid assumes you start with $0 and your savings are invested at a 7% annual interest rate. Let's take for example you start at age 25 saving $16,000 a year and investing it at a 7% annual interest rate, you can achieve $1 Million dollars at the age of 50. 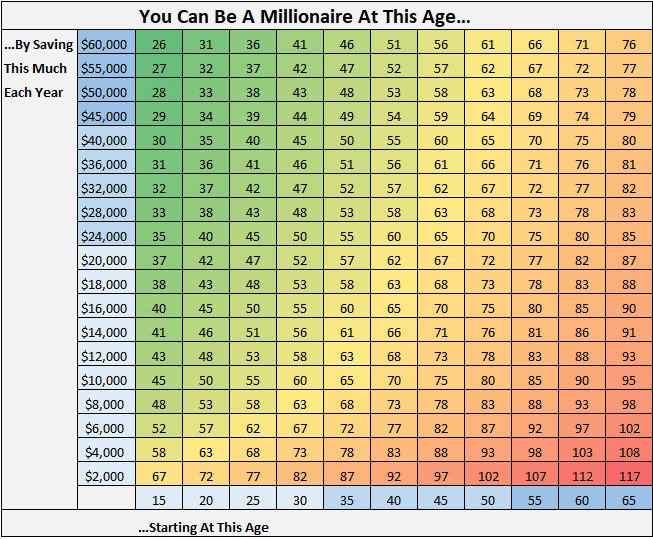 Even at 50 years old, if you manage to save and invest $40,000 a year, you can become a millionaire at age 65. But, do we really need a Million dollars to achieve $2000-$3000 per month income during our retirement years? There are a few methods for drawing income for retirement. The first is drawing out from our lump sum savings for our monthly needs until it runs out. This is what a lot of people have done. $1 Million dollars will only last 27 years if we draw out $3000 every month. The second method is to get a monthly income through an annuity. We pay a fixed amount of money to buy into an annuity then get monthly payments when we retire. In Singapore, all of us are enrolled into a national annuity called CPF life. Through the survey, CPF savings was one of the top choices which many of us will be using for retirement. Through the CPF life scheme, a sum of $249,000 at age 55 will get us a monthly payout of about $1860 to $2000 when we reach 65 years old. This will be paid to us all the way until death. It seems like we don't need $1 Million to get a comfortable income of about $2000. The only problem I guess people have with CPF is the payout age is too late. It would be better if there is some kind of payment before age 65 but I guess we would need a lot more savings in the account to get the same payout if that ever happens. Nevertheless, I still think CPF life is a good income stream for our retirement. For us who want to have some income stream before age 65, we would have to plan something additional which leads me to the third method. The third method to get monthly income is through investing in good dividends stocks. When we have accumulated some savings, we can invest and get some income through dividends. Let's just use 4% as a safe margin for dividends. If we have $1 Million in cash and invest to get 4% dividends, this would translate into $3333 per month for us. The problem is $1 Million may be somehow hard to achieve for some people. I've mentioned retirement a lot of times in this article but to me, achieving the savings or monthly income is not to retire and do nothing at all. Its all about having some freedom to choose what we want to do in life instead of being stressed at work because we have to work for money. As mentioned, CPF life is one of the monthly income streams we can look forward to. However, it only pays out at age 65. We can probably have some plans to achieve a certain monthly income through stocks investing or other methods before age 65. Targeting to save $500,000 and invest at 4% interest would get us $1666 per month. This could probably be achieved before age 50. Once we reach age 65, CPF life would payout probably $2000-$3000/month depending on the sum we have in our accounts. The maximum amount in CPF now is $249,000 which pays out about $2000. By the time most young people, in their 30s currently, reach retirement age, the amounts should have adjusted upwards so they could be looking at payouts of $3000 or more. If you're reaching 55 soon, you could plan to get more than $2000 in monthly payouts. The CPF retirement sums will increase accordingly to adjust for inflation. Achieving monthly income of $2000-$3000 shouldn't be that difficult if we use the right tools. Saving up and investing in stocks is a good way to build some passive income while CPF life also provides some stable income in our later years. If we can achieve $1 Million, it would be good but it seems like even if we did not have $1 Million dollars, we could still retire quite comfortably. Comfort Delgro just reported their Q2 financial results last week and this was what I was concerned about as I've invested some money into it. Being affected by Uber and Grab's private hire services, Comfort's taxi business took a hit and sent its share price going down which makes it look like an attractive investment at that point. After I bought, the share price still continue to went down by a little and seems to have stopped at around $2.30. Anyway, its Q2 financial results still doesn't paint a good picture. Net profit fell by 6.8% mainly contributed by lower revenue of its taxi business and unfavourable FX from the weaker UK Pound and RMB. For its taxi business, there is lower revenue from Singapore, China, Australia and Vietnam. The only increase in revenue was from UK but it was completely eroded by the weaker Pound. The only saving grace is from the public transportation business where SBS Transit's bus revenue increased due to the transition to the bus contracting model (BCM) and also higher revenue contributed from higher ridership on DTL and NEL/LRT. Australia's public transport business registered an increase in revenue too with higher charter revenue from rail replacement. Despite the bad quarter, comfort is giving higher dividends of 4.35 cents for FY17 as compared to 4.25 cents in FY16. Cash generated from operations also registered an increase as compared to last year. It is still a financially stable company with gearing of 12.5%. Moving forward, I'm still seeing quite a lot of comfort's taxi on the streets but also seeing more people using the grab and uber app all around. However, we have to note that Grab incurred a combined loss of nearly US$40 Million in 2014 and 2015 alone. As for Uber, it said that it lost US$708 Million for its worldwide operations. Grab and Uber are giving discounts to riders so heavily and on top of that giving incentives to drivers too. This doesn't seem to be sustainable. I believe when the discounts end or when the incentives for drivers decreases, the taxi industry will pick up again. I did try to drive for Uber for 2 weeks last year and from my experience, you don't really earn much as a driver if you don't get the driver incentives. This is what is attracting more drivers and even taxi drivers to drive for Uber and Grab instead but it will end when incentives are no longer available. As for its public transportation business, Revenue is expected to continue to increase as the DTL 3 opens in Oct this year. Rail revenue is expected to double as ridership doubles as well. There is also the new thomson east coast line which has yet to be awarded as well. Its PE is currently trading at 15.42x with dividend yield of around 4.5%. To me, I still think its a fair valuation and I will continue to hold on to this investment. Far East Hospitality Trust just released their financial results last Friday and I thought it would be good to do a quick update since I've been writing a lot on the hospitality industry as an investment opportunity. Net property income still decreased by -6% in 2Q 2017 as compared to 2Q 2016. However, this is a smaller decrease compared to the 1Q decrease of -10.4%. Average hotel occupancy was 87.1% in 2Q as compared to 88.1% in 1Q. Comparing year on year, occupancy increased 1.9%. RevPAR remains stable at $134 which is a good sign that it has bottomed out. Comparing year on year, RevPAR decreased -4.6% in 1Q while it decreased -1.3% in 2Q. This is a smaller decrease which is again a good sign that RevPAR is bottoming. In summary, hotel occupancy has increased by 1% for the 1H of 2017 while serviced residence has decreased by -8.7%. RevPAR still remains low but shows signs of bottoming out. Far East Htrust portfolio consists of 64.8% hotels, 12.9% serviced residences and 22.3% commercial which contributes to its gross revenue. From the time I invested in this stock, the stock price has gone up by 10% and I've divested a portion of my investment in this stock at 0.67. It is still trading at a PB of 0.74 which represents a discount to NAV of 26%. The dividend yield at current price is about 6.24%. The reason for divesting it is to lock in some gains first while monitoring it for any other upside. I also did a check on one of its competitors, Frasers Hospitality Trust and looked at its Singapore properties portfolio. I noticed that Frasers Htrust Singapore properties registered a higher RevPAR for both its properties. It is an impressive gain of 4.1% Y-Y. For all its other countries portfolio, the gross operating profit also increased. Frasers Htrust will be the next investment opportunity I'll be looking at. However, it's trading at a PB of 0.99 and dividend yield of 6.53%. It seems to be at a fair price currently so if we want to invest now, there may be limited upside. I shall monitor and keep it in my watchlist for any good entry points. REITs have been a popular investment choice for many years now. Even for me, REITs constitute about 60% of my portfolio currently in sectors such as retail, hospitality and commercial. Recently, REITs prices have mostly gone up which is a good time for a review now. I will look into the different sectors and the outlook plus if there's any other opportunities to continue investing in. It may be time to sell some REITs and invest into other opportunities too. Firstly, let's look at retail REITs. In Singapore, we have a few REITs which dominate the retail scene here. Capitaland Mall Trust and Frasers Centrepoint Trust owns most of the shopping malls in Singapore. Collectively, they own 22 of the major shopping malls in Singapore which are mostly near MRT stations. I have invested in both of the REITs for sometime now. They have provided good dividend income at around 5%-6% pa. However, retail REITs don't really have much capital gains in general as its quite hard to expand and have more shopping malls in an already competitive environment. The retail sector will be faced with competition moving forward. The rise of online shopping means fewer people will be shopping at the stores itself. I like that the REITs have reinvented themselves where we can see most of the stores in shopping malls now are F&B. Singaporeans still like to eat outside a lot. Capitaland mall trust recently reported their 1H financial results and one highlight is that shoppers traffic has declined -0.5% in 1Q 2017 as compared to 1Q 2016. This may also be linked to the weak employment data as released by MOM. Unemployment has gone up particularly for Singapore citizens while total employment has decreased for 2 consecutively quarters this year as seen from the preliminary figures released by MOM. Apart from the poor outlook, we are also seeing some developments in the retail scene. For Capitaland mall, they are redeveloping Funan, which was the popular IT mall in the past. It will reopen again in 2019 with new experiences for shoppers. This will boost the dividend income from the REIT moving forward. For Frasers centrepoint trust, they are doing AEI for northpoint which is a popular shopping mall in Yishun. This is expected to be completed in end September 2017 and they aim to improve the average gross rental rate of Northpoint by approximately 9% upon the completion of the AEI. Both REITs are trading at prices above book value now with CMT at 1.03x PB and FCT at 1.13x PB. There are many commercial REITs in Singapore. I shall not go into the details of each REIT but focus more on the general trend of the office market in Singapore. As we see previously, total employment in Singapore has decreased but if we dive deeper into the MOM numbers, the decline is mainly due to lesser work permit workers in the construction and manufacturing sectors. This does not really affect the commercial REITs in Singapore. 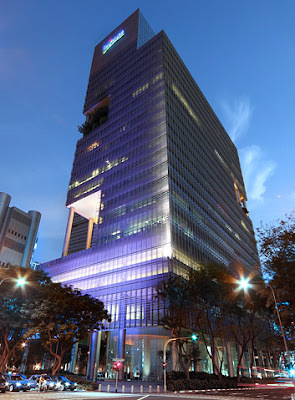 I have invested in Capitaland Commercial trust (CCT) and also Suntec REIT. 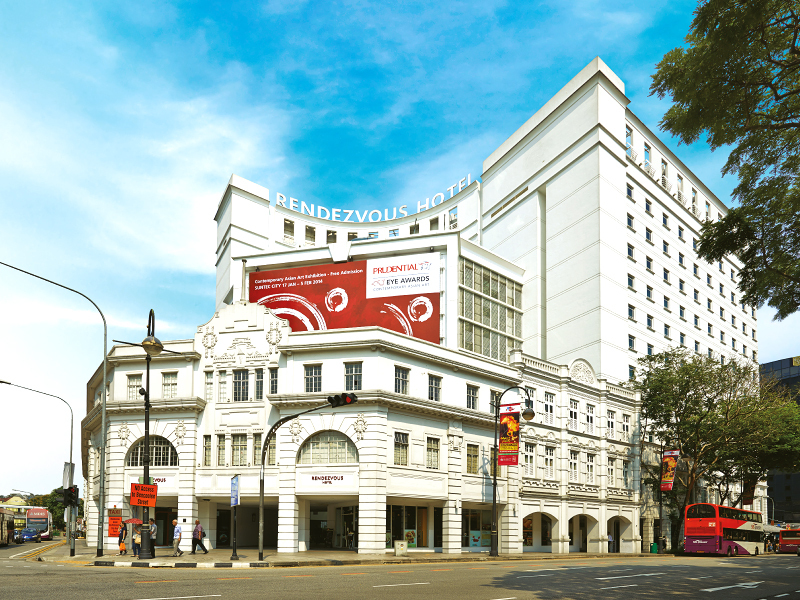 Both own office buildings in Singapore with commercial as their main portfolio. Suntec REIT does have Suntec City, which is the shopping mall in their portfolio but that only accounts for 7% of their overall portfolio. Office portfolio accounts for 69% of their income. In CCT's latest 2Q financial results, I saw a distinct trend in the occupancy rate chart which they have. If we look carefully at the below chart, the CBRE's core CBD occupancy rate has declined in 2Q 2017. This covers offices in Raffles Place, Marina Centre, Shenton Way and Marina Bay. It is not looking too good for CBD offices. On the other hand, CCT and Suntec's committed occupancy rate remains quite stable. Moving on to office rents, grade A office market rent has remained unchanged Q-on-Q after seeing consecutive decline from 2015. It may signal that the grade A office market rent decline has bottomed out. Supply of office spaces is expected to continue to increase in 2017 so there should still be some pressure on the office rents moving forward. The stock price of CCT and Suntec REIT has risen by quite a bit these few months. However, both are still trading below their book value. In terms of dividends, base on the current price, the dividend yield is around 5.2%-5.3%. Lastly, let's move on to hospitality REITs. 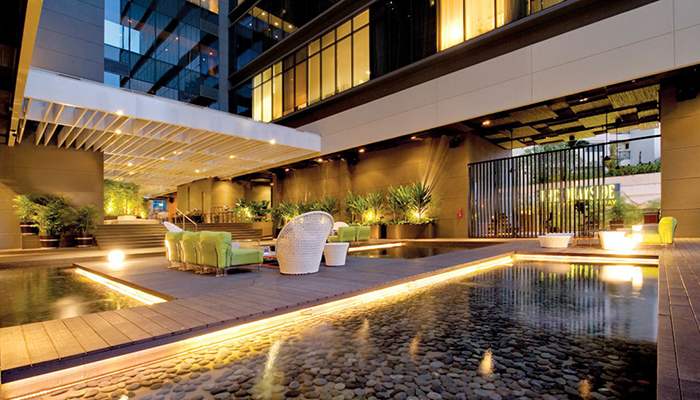 A few months back, I wrote about an investment opportunity in the hospitality sector. You can read it here. There have been many articles on how this industry will do well and also coverage by various research houses and analyst. This will be an update based on the latest financial results from some of the hospitality REITs. At this point, I'm invested in CDL Htrust, Ascendas Htrust and Far East Htrust. CDL Htrust just released their financial results last week with higher NPI and DPS (excluding effects of rights issue). They recently just did a rights issue at an attractive price and I went ahead to subscribe to the rights issue including trying my luck for some excess rights. Its portfolio is doing relatively well with the biggest gain from its New Zealand hotel at 91.9% increased in net property income (NPI) for 1H 2017 as compared to 1H 2016. This is really an impressive gain. The main reason is because its revenue per available room (RevPAR) for the New Zealand market surge 49% year on year. CDL Htrust Singapore hotel market RevPAR is still declining at -1.1% year on year. As mentioned in previous articles, we should see RevPAR bottom out and start rising as hotel supplies taper off in 2018. As we can see from the case of the New Zealand hotel market, a surge in RevPAR can really improve the NPI by quite a lot. Visitors arrival to Singapore remains high with 4.4% increase YoY. STB, SIA and Changi Airport Group (CAG) recently launched the second edition of the Singapore MICE Advantage Programme to draw more business events to Singapore as well as a S$34 million investment to strengthen Singapore’s destination appeal and drive visitor traffic. Elsewhere around the world, Japan hotels are not doing so well as RevPAR has declined due to price competition from increase in new hotel rooms supply. We should see better performance moving ahead to the olympics games in Tokyo. Far East Htrust and Ascendas Htrust have not reported their results yet though. In terms of valuation, CDL Htrust is already trading above book value at PB of 1.07x. Far East Htrust on the other hand is still trading below book value at 0.73x. It has gone up the past few months and my investment in this is sitting on a 10% return. Hospitality Reits have a dividend yield of around 6.2% currently. It can be a good dividend investment buying at the right price with attractive dividend yield. I'm looking to accumulate further into this sector. Will REITs continue to perform? I've touched on 3 different sectors namely the retail, commercial and hospitality REITs listed in Singapore. REITs present a good opportunity for those who buy at the right valuation. For me, I look at the outlook, the valuation, its financial stability, dividend yield and management strategy. Where possible, its good to check out the properties of the REITs wherever possible. Seeing crowds at a mall and all the shops having business is a good sign as oppose to an empty mall with no business. I would look closely and monitor the developments of the retail and commercial sector while continue investing in the hospitality sector moving forward.